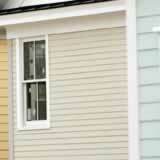 Home | Vinyl Siding Styles | Brickface Siding Styles | Brick: Is it Maintenance Free? The exterior of your home should say something about you, and few things offer the bold, stately impression of brick. Many of the more distinguished homes in your area likely have brick on the exterior. Some of the oldest structures in the country are brick, which is a testament to its durability. Brick is not entirely maintenance free, but very close to it. Perform some occasional upkeep tasks, and your brick will look its best for the life of the home. Cleaning. Depending on the location of your home, the brick may need some washing once in a while. A basic water hose should suffice. Be careful if you use a pressure washer, as some brick and mortar becomes damaged under high pressure. Weep holes. Brick and mortar are porous. There should be several small holes in the mortar above the finish grade around your home and around windows and doors. These are weep holes that allow moisture to escape from behind the brick. Make sure the weep holes are not clogged by dirt or debris. Mortar. Homes in cold climates are subject to hard freezes in the winter. Moisture in a mortar joint expands as it freezes and over time may cause the mortar to loosen. This is easily corrected with mortar touch ups. Many modern homes use a combination of brick veneer and vinyl siding for a near maintenance-free exterior. Designers use varying combinations of the two materials to create unique, attractive styles. Whatever style home you prefer, traditional and elegant, country casual, or anything in between, you can achieve it with brick.